Families are invited to support other families with students who will be making their first Reconciliation on Saturday night during 5pm Mass. There will be a supper to follow afterwards in the school hall for those involved. This coming Sunday the Church celebrates Laetare Sunday, the fourth Sunday of Lent, during which we express hope and joy in the midst of our Lenten fasts and penances. Laetare means rejoice. You may notice a change in the colour of the vestments worn by the priest too, from violet to pink, or more fittingly, rose. This colour change is optional. The change in colour indicates a glimpse of the joy that awaits us at Easter, just before we enter into the sombre days of Passiontide, the two weeks between Palm Sunday and Easter. Not eating meat on Fridays. 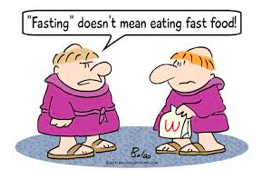 The rule that Catholics cannot eat meat on Fridays during Lent is not quite right and it is much more lenient now than what most Catholics in history have had to observe. Nowadays meat is only prohibited on Ash Wednesday, Good Friday. The idea was that Catholics should fast or take light meals and asking us/them to not eat meat was a sure way of ensuring everyone fasting. Now people are asked to fast and can choose what is best for their situation. The purpose of fasting is spiritual focus, self-discipline, in the imitation of Christ and a way of showing sorrow.